The last time MIX fixed up its licks at CCA, it was because MEOW WOLF had made something amazing out of a bunch of sticks. This time time the art is more minimal, but also tending toward the mindbending. In a site-specific commission for CCA, artist Matt Barton has created immersive exploration of light’s scientific and phenomenological qualities. Additional art comprehension assistance will be aurally applied courtesy of–no kidding–DJ MAGIC TOFU, the venerable volume vendor with supernaturally non-meat beats. Meanwhile, KALEIDOSPOKE’s bafflingly beautiful bicycle-art bacchanal will also be wrecking retinae for those brave enough to behold that kind of bad-assery. Plus, rumor has it, some celebrity thugs will be rattling spray cans with vigor, abandon and unusual talent. This is the last chance to enjoy a frenzied, awesome, memorable and madcap MIX before next month drops a bomb on the entire city (or at least Saint Michael’s Drive)…so come on out and hatch a conspiracy with us; we’ve got the roomiest cabal in town. 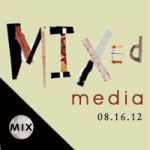 As always, MIX is a private event, but YOU and YOUR GUESTS are invited. * There are A LOT of cans to hand out, but they won’t last forever and we WILL run out–this is a first come, first serve situation. ** We love that COWGIRL runs a tight ship: bring your ID no matter your age and be nice to the booze vendor–it’s cocktail karma and it do come around and it do go around. *** We cannot be responsible for predicting the latest diet fads and this is actually an entirely empty promise.